Another big WPT event finished up, this time in North Cali at the Bay 101 Shooting Star tournament. The price reduction from $10,000 buyin to $7,500 had a double positive impact with both an increased field and prizepool. Paul “paulgees81” Volpe (West Chester, PA represent) continued his hot streak with his 2nd straight WPT final table and 3rd place finish for $435,610. That puts him just over $1,000,000 in tournament earnings for $17,500 worth of buyins for the last two WPT events, not a bad ROI. 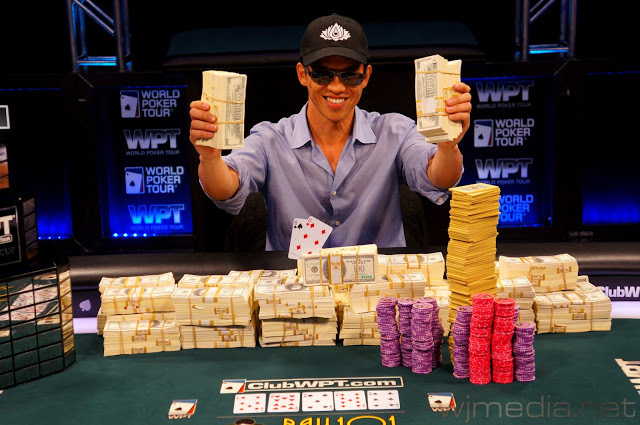 Kai Chang won the tournament for $1,138,350 plus a seat in the WPT Championship for topping the 643 entrants. No word on how many bounties he collected during the event but it probably was a decent addition as well. Some big results expected in the next few days from the Heartland Poker Tour and WSOP-C. The HPT had another successful event at Black Hawk with over a $1,000,000 prizepool and the WSOP-C Caeasers Atlantic City Main Event will give away another ring within days. Tweet of the Day – Euro-Schecky tweets from the completely spontaneous, not-at-all corporate set up, Full Tilt Poker versus PokerStars Heads Up competition. Rumor has it PokerStars stars won the day. My Choice Center Experience – Daniel Negreanu responds to the article from Bryan Micon about the Choice Center. It’s totally not a cult and completely legit, guys, because he said so. I was finally convinced after he also told me I inherited a million dollars from some guy in Nigerian. Illinois Bill Would Legalize Online Poker – Another state trying to get into the online poker business. Keep expanding and maybe we’ll all be back in business before too long. As States Embrace Online Gambling, Questions Arise – But somebody has to be Chicken Little during the online poker discussion and NPR presents their “questions” in a short, relatively benign article. Dusk Till Dawn to Guarantee €1 Million to the Winner of ISPT Wembley! – More news from the International Stadiums Poker Tour, now with a €1,000,000 guarantee for first place. Points taken away from PokerNews by our impartial judges for using @#$^@$ exclamation point in a headline. Poker Terms IRL-London Edition – PokerNews and Sarah Grant with a fun video from the EPT London.